Now that it’s winter, most of us prefer to stay indoors, venturing out into the cold as little as possible. But not our hardy second graders! Each winter, they look forward to trekking deep into Principia’s woods to learn and experience for themselves how Native Americans have lived off the land over the ages. 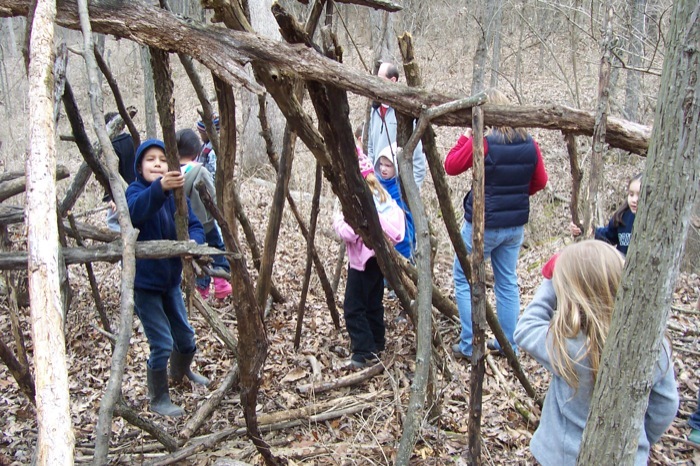 With the help of their teacher, Doug Hoff, and Principia parent Monnie Brodbeck, students identify usable natural resources and construct a shelter of twigs, leaves, and branches. This day-long “survival” adventure is one of many ways that learning in Lower School takes on an experiential dimension, featuring firsthand discovery and doing. It is also an example of the multidisciplinary approach to instruction that infuses all levels at Principia School: science, social studies, and language are often combined rather than compartmentalized, making the information, skills, and activities in each area mutually reinforcing. The study of indigenous cultures is one of the main learning themes during second grade. This year started off with a field trip to Cahokia Mounds in southern Illinois, the site of one the most sophisticated and the largest Native American settlements north of Mexico—with a population larger than that of London, England, during the mid-thirteenth century. Experiencing this amazing “slice of history” virtually in St. Louis’s backyard makes those long-ago times and practices more tangible to young learners. Toward the end of the first semester, each second grader researched, wrote, and presented a “paper” on the Native Americans of a specific region of the United States–focusing on their use of natural resources for clothing, food, and shelter. The students spoke with aplomb before a group of parents, peers, and other visitors—having been coached on voice modulation, eye contact, and posture. Hoff credits the Principia kindergarten and first grade teachers with preparing the students to move into this kind of study and presentation with a sense of confidence and naturalness. The final unit—on the rainforests of Central America—is closely coordinated with the Lower School science teacher, Mary Jane Hoff (Doug’s wife), and art teacher Louise Elmgren-Carlson. Taking things one step further, Hoff and assistant teacher Karin Butterfield have helped students in past years write letters to large corporations about their use (or non-use) of sustainably produced natural resources from these areas. Often they hear back—and in the process polish their communication skills and learn that their “voice” counts. Probably the most exciting project of this springtime unit, for students and teachers alike, is creating a “documentary” video about the Embera people of Panama. Last year’s video was filmed “on location” (in the Prin woods) and showed the students dressed in traditional garb engaging in typical day-to-day activities—spear-fishing, cooking, and dancing. There were also many “sightings” of rainforest animals such as spider monkeys, ocelots, anacondas, and poison-dart frogs (paintings or 3-D renditions that the students had produced in art class). Most important, all the students got to share their understanding by explaining or demonstrating various aspects of the culture, environment, and wildlife, thereby creating a rich learning experience for everyone involved. This year, there will be an additional culminating highlight—an overnight camping trip that will pull together the second graders’ study of science and history and is sure to be a lot of fun, too!